aim to make a difference by empowering citizens and engaging them with Open Data. Throughout the document we suggest key concerns to focus our project attention as we invite experimentation and exploration in the five pilot sites. The figure represents a word-cloud of the total text in the literature review and field studies report; offering a ‘lightweight’ illustration of the topics covered. First (in section 1) we outline how the deliverable is situated at the outset of an explorative project that will run the next two-and-a-half years. We determine the scope and the structure of the deliverable and detail the snowball method by which the review has come into being. We then turn to situate our O4C efforts among other initiatives and projects that pioneer and define open data (in section 2). We describe how a number of challenges pertain to enabling meaningful use of open data sets and repositories made open to the public. The actual value of open data is closely tied together with actual use of it, but in practice many elements (institutions, organizations and different groups of people) has to be joined together in new ways. Controversies and discrepancies may lurk on several levels between ‘data-demand’ or data-relevance versus existing ‘open data-supply’. This complexity underlines the importance of what we will do in the O4C project: It is crucial to explore how more involving activities, connections, networks and collaborations can be established around open data. The case-example on co-creation with open data in Rotterdam highlights what can be gained when academia, private sector representatives, creative industry and the local municipality work actively together around open data. Important feedback can flow back and forth and a more social sustainable policy agenda can be created; also inviting more active and meaningful use of open data. Following this exemplification, we elaborate what inspirations give initial shape to our citizen-centered approach (in section 3) – and how we regard the design challenge in front of us as that of creating collaborative open data ecosystems that invite citizens, various stakeholders and other interested groups to tinker with open data together. We highlight a few details on cases we find particularly inspiring at the current moment: The case of “My Neighbourhood”, reminds us about the importance of trust, meaningfulness and relevant ‘gatekeepers’ when building digital information technological initiatives. The project “Mappina” illustrates a community-based, creative and alternative city-map-making. Furthermore, the “Buurt Bestuurt” and “Better Reykjavik” examples suggest a way forward that allow for more authority given to the voices of citizens and local residents through the application of information technology and data related applications. Lastly the cases from Barcelona; “i2Healthsanpau” and “Fabra&Coats”, remind us how there might be interesting avenues to follow by experimenting with cross-fertilization and inspiration between different sectors; e.g. between health innovation and urban service development. In the following chapter (section 4) we detail how the format of the ‘hackathon’ is particularly suitable for igniting collaboration, ideation, multi-disciplinary networking and productive data tinkering in practice. The hackathon cycles we will host within the framework of the O4C will draw on methods and process-facilitation inspired from co-design events and design/service jams. We hope to facilitate processes that spur inspiration, ideation and implementation related to open data across multi-disciplinary teams of various backgrounds and expertise/skill levels. We see that a broad variety of fields and backgrounds ideally should be synthesized and we will strive to connect design methods with other ways of working with and making sense of data. Furthermore, we will both draw upon and eventually supplement the existing body of knowledge that advice on how to organize hackathons and explore open data. Before drawing conclusions (in the final section 6) we initiate reflection about the social impact of our project by suggesting a first take on a definition of social sustainability (section 5). We take the first steps here and allow for the notion of sustainability to be further elaborated in WP4: Social Impact and Sustainability. On several levels social sustainability is a relevant term. We aim to enable and empower citizens to use open data in support of social sustainability at the local level. A key objective for our project is also to establish the OpenDataLabs as a sustainable platform and network for meaningful innovation with open data. The vision is that of an international movement of empowered citizens who understand the opportunities of open data and are able to collaborate with other key stakeholders. This is why the characteristics of the global Fab Lab movement is described in detail – as an illustrative example of what we hope to create around open data. Open data might remain more abstract and intangible than what is possible to produce in a Fab Lab, but the Fab Lab movement do represent a model for a locally situated but globally dispersed network; inviting practical data-tinkering as an important method for creation and innovation. 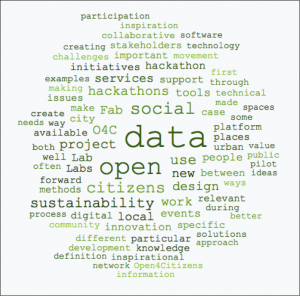 In the OpenDataLabs we might in a similar manner make available tools, software and data expertise – as well as organize events and initiatives to encourage and inspire broader groups of citizens to begin to make use of open data. Inspired by a slogan from the world of ‘fabbing’, we will involve citizens to ‘think globally but tinker locally about open data’. The full text of the deliverable will be available after its approval best price for viagra 100mg.